I received this cigar from Cigars Direct; as always, all reviews are my own. 0/3: I have reviewed the Camacho Triple Maduro 50/4.5 twice before and I absolutely loved it both times. In fact, I did a full review of this very cigar back in 2009 and gave it 95 points and the Short Cigar Review I did saw the Camacho Triple Maduro receive 5 out of 5 points. Of course, that was back in 2009 and even if I haven’t “matured” as a cigar smoker since then my tastes have changed. Although, I liked full bodied cigars back then as well so…. Solidly packed and very dark, the wrapper is slightly oily with a couple of small veins running from the foot to the cap. 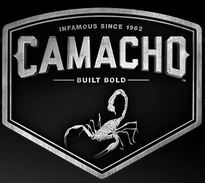 This cigar has the old band on it (the Camacho website shows a new band so I’m assuming that’s not just for web marketing purposes). 1/3: Heavy flavors greet you from the get go. Deep sweetness and earth notes as well. Very good so far. 2/3: Sweetness – the dark fruit kind, the kind that I like – earth and a great smokiness that adds a really nice dimension to the flavor profile. It may not seem like it from the description (I’ve never been one for “flowery” language, although mimicking said “flowery” language helped me win a writing competition or two in school) but there is some complexity to this cigar. 3/3: Mostly a continuation of the second third. If possible, the flavor profile does get a bit heavier; you know you are smoking something good when you smoke one of these cigars. 4/3: I do like this cigar. I’d peg it in the medium-full bodied range with a good draw (excellent even) and burn; this cigar may not be full of bold, in-your-face/take-no-prisoners flavors but, rather, deep, brooding flavors that remind me of French cuisine. I can’t say that I like it as much as I once did but this is still one of those cigars that I enjoy revisiting from time to time.